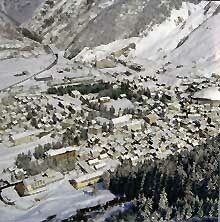 Andermatt used to be a favourite of the British, but has since fallen on harder times. Now it is more known as a mountain troop base, although many skiers still take the train up to enjoy excellent snow, a reasonable range of slopes (56km) and some top off-piste. Andermatt deserves to get more coverage, particularly for experts who want to get off marked trails up on the Gemsstock. Because it's a little run-down, the lifts aren't exactly the most high-tech and efficient, but Andermatt still maintains its picturesque charm. And because it has slipped behind other resorts, it remains delightfully uncrowded. There are no buses and you have to use the train to get around. You can also take the train to Davos, St Moritz and Zermatt. The village has plenty of slope-side accommodation but there's a limit to après-ski, nightlife and other non-skiing stuff. And the barracks don't really maximise the views! Overall, Andermatt is a slightly old-fashioned resort that deserves a return to its former glory. If you want good snow and quite tough terrain, this is the place.